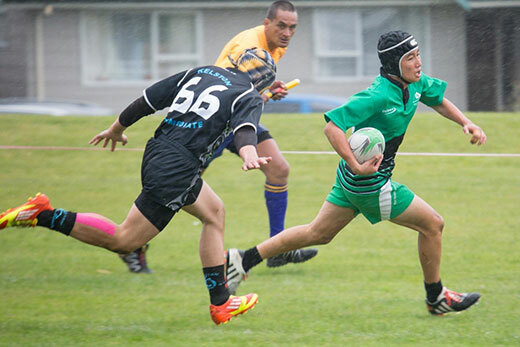 Mount Maunganui Intermediate have created a slice of history by becoming the first local team to capture the rugby sevens title at the NZCT AIMS Games in Tauranga. And they did so in some style, grinding the bigger Kelston Intermediate side into the Waipuna Park mud in a relentless display of committed defence. The victorious Mount Maunganui Intermediate squad. Photos: Jamie Troughton/Dscribe Media Services. Captain Ethan Stuart sealed the 12-0 win with a late try, adding to Josh Nicholson’s first-half strike, but it was their tackling that made all the difference. Mount accounted for defending champions St Peters Auckland in the quarter-finals before beating arch-rivals Tauranga Intermediate in the semis, while Kelston eased past Pukekohe 15-0 in their semi-final. 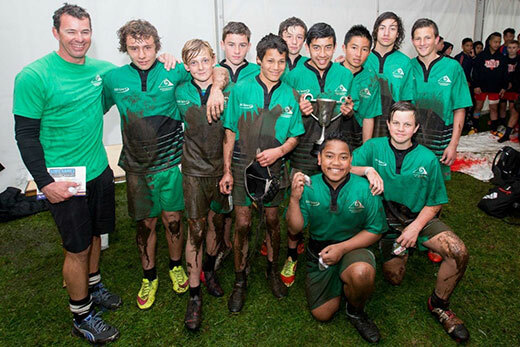 Meanwhile, Hastings Intermediate are the 2015 AIMS Games rugby league champions, after thundering to victory through mud, rain and an undefeated Orewa College. 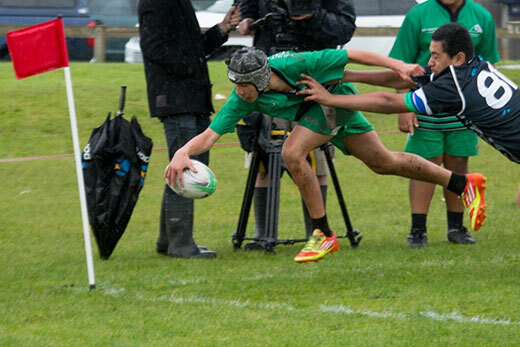 When the two teams faced off during the pool games, Orewa narrowly beat the title-holders 24-22. That made the final‘s 14-0 scoreline all the sweeter for Hastings. 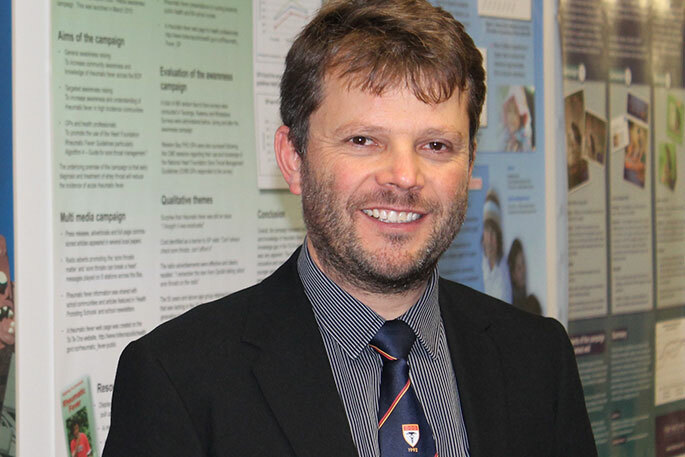 Hastings came out of the pool games in third place, but Hastings parent Matthew Troydyn said that only spurred the Hawke’s Bay school on. “Even though we had the harder road, that gave the boys a bit more mongrel to get on top,” Troydyn says. The game was much closer than the score suggests. Orewa pushed the action into the Hastings half for most of the game, but strong defence kept them from getting over the line. A stand-out performance by Hastings player Art Thompson, who scored one try and made one huge run, sealed the deal. 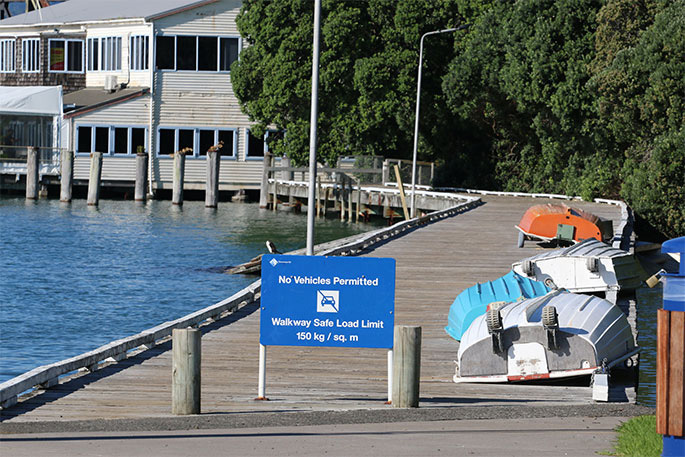 Orewa assistant coach Te Vita Manukia said although they hoped to unseat the reigning champions, they were stoked with their performance in the tournament. “We’re not the biggest team here – we’re just proud to make it to the finals,” he says. This is the second year running that Hastings have taken the championship, after beating Rotorua Intermediate 12-6 in the 2014 final.